Feelings are delivered perfectly when you send this Exquisite Fresh Fruits Basket Hamper and spread your love in the lives of the people dearest to you. This gaudy looking Basket is stuffed with 3 Kg Mixed Fruits (1 kg Apple, 1 kg Banana, 1 kg Seasonal Fruit) and 10 Red Roses Bouquet with 1 Regular Rakhi and Roli Tilak Chawal. Feelings are delivered perfectly when you send this Exquisite Fresh Fruits Basket Hamper and spread your love in the lives of the people dearest to you. 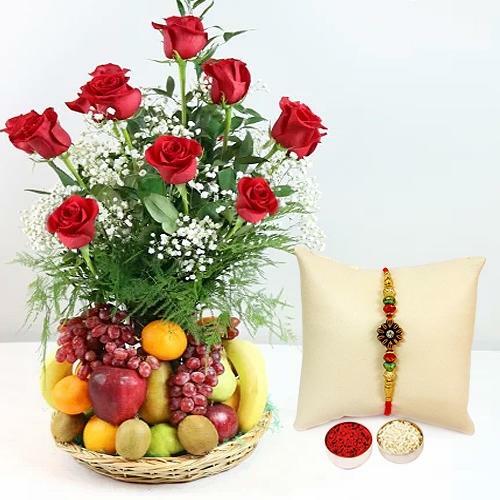 This gaudy looking Basket is stuffed with 3 Kg Mixed Fruits (1 kg Apple, 1 kg Banana, 1 kg Seasonal Fruit) and 10 Red Roses Bouquet with 2 Regular Rakhi and Roli Tilak Chawal. Feelings are delivered perfectly when you send this Exquisite Fresh Fruits Basket Hamper and spread your love in the lives of the people dearest to you. This gaudy looking Basket is stuffed with 3 Kg Mixed Fruits (1 kg Apple, 1 kg Banana, 1 kg Seasonal Fruit) and 10 Red Roses Bouquet with 1 Bhaiya Bhabhi Rakhi and Roli Tilak Chawal. Feelings are delivered perfectly when you send this Exquisite Fresh Fruits Basket Hamper and spread your love in the lives of the people dearest to you. This gaudy looking Basket is stuffed with 3 Kg Mixed Fruits (1 kg Apple, 1 kg Banana, 1 kg Seasonal Fruit) and 10 Red Roses Bouquet with 1 Family Set Rakhi and Roli Tilak Chawal.